but are light enough to serve as an appetizer as well. 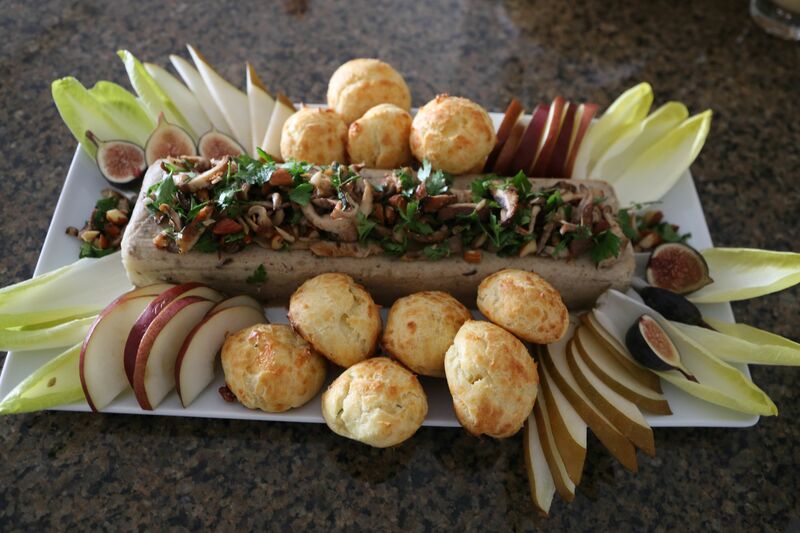 I recently made gougères to accompany an exotic mushroom pâté I served at a play date. 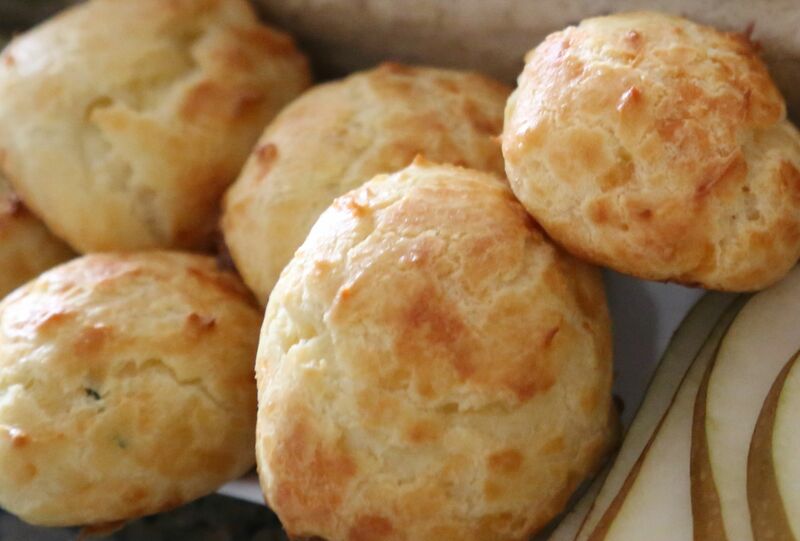 The easiest way to describe gougères is to call them savory cheese puffs. Their dough, pâte à choux (or choux pastry), is a light pastry used to make a variety of French pastries, including sweet cream puffs or profiteroles. When the pâte à choux is destined to become gougères, grated cheese is added to the dough. I have used Gruyère, Comté, or Emmenthaler. I was first introduced to gougères as a child. My mother filled hers with meat and vegetables and served them at parties or special events. I usually prefer to serve mine unfilled. Savory and light, they can stand on their own. Gougères are made everywhere in France but they are originally from Burgundy, where they are often the first thing you get when you sit down in many restaurants. Gougères are also often served with the local aperitif. They nicely accompany a welcoming glass at a cocktail party or when celebrating with champagne. Add eggs one at a time by hand, with a wooden spoon or on low speed with an electric mixer, beating rigorously after each addition. Make sure the paste is smooth each time before adding the next egg. Continue to beat with each egg until the dough is smooth and shiny. Add 1 cup grated cheese into pâte à choux at this time. The paste can be covered and refrigerated for up to 4 hours (or more); you do not need to bring the paste to room temperature before shaping. Form into approximately 1-inch puffs on an ungreased cookie sheet. Bake at 400° F until golden brown, approximately 30 min. Watch carefully as oven temperatures may differ. Yield: Approximately 2 dozen puffs. Recipe Source: Adapted from the Joy of Cooking. Martine’s note: When making the pâte à choux, it is important to be sure that each egg is fully incorporated into the batter before adding the next. Don’t worry if the batter separates and looks curdled at first. Keep beating, and it will come together nicely. For added flavor and texture I sometimes add chopped fresh herbs (chives, rosemary or parsely). I also normally make my paste the night before I plan to serve them and refrigerate overnight. I then shape and bake it the next day, straight from the refrigerator. I find that the consistency is better if the paste is refrigerated for at least an hour. To add a filling, pierce the bottoms of the puffs and use a pastry bag to pipe in filling.